A pair of Windows 10 feature upgrades will soon collide, with one just beginning to get traction on PCs as its successor readies for release. It's unclear how Microsoft will handle the dilemma, which traces its roots to the debacle last year when the company was forced to pull the fall feature upgrade after it deleted user files without permission. According to AdDuplex, a Lithuanian company whose technology is embedded in thousands of Windows Store apps, Windows 10 October 2018 Update - 1809 in Microsoft's yymm labeling format - powered just 21 per cent of surveyed Windows 10 systems as of 25 February. That percentage was less than a fourth of the 85 per cent running 1709 - Windows 10's second feature upgrade of 2017, and the closest comparison for 1809 - at the same time in its timeline. Windows 10 1809 was initially released on 2 October 2018, but within days Microsoft purged it from the distribution pipeline after reports of upgrade-caused data loss. Although the company returned 1809 to testing that same month, it wasn't until 13 November that it announced the upgrade was again available to the general public. However, automatic dissemination didn't resume until 16 January. The late start of 1809 and Microsoft's caution in re-releasing it meant that the upgrade now boasts the slowest adoption of any Windows 10 version recorded by AdDuplex. But 1809's follow-up, designated 1903 and likely named "Windows 10 April 2019 Update," is nearing release, according to both clues in the code and the accepted schedule. Unless Microsoft purposefully delays 1903, it should begin rolling out to customers no later than the middle of April. That will be a problem. Because Microsoft demands that users of Windows 10 Home download and install feature upgrades as soon as they're offered, the Windows 10 update regimen is on a tight six-month schedule. With 1809's automated distribution starting three months late, 1903 will be hard on its heels. It's as if the 1809 release train was late out of the station and the follow-up 1903 couldn't be kept waiting and so rolled out on time. The result: A likely rear-end collision. The data from AdDuplex, while not authoritative, suggests that the slow restart has left a landslide-sized majority staring at some ugly possibilities. 1. Run 1809 for a short time, maybe for a very short time: Assuming Microsoft wants to make up for lost time, it will serve 1903 faster than it did the problem-plagued 1809. Based on past adoption trends as described by AdDuplex, the top 50 per cent - the first half of Windows 10 users who were given the upgrade - will run 1809 for as few as two months, getting onto that upgrade by the end of March 2019 but forced to move to 1903 by the end of May. 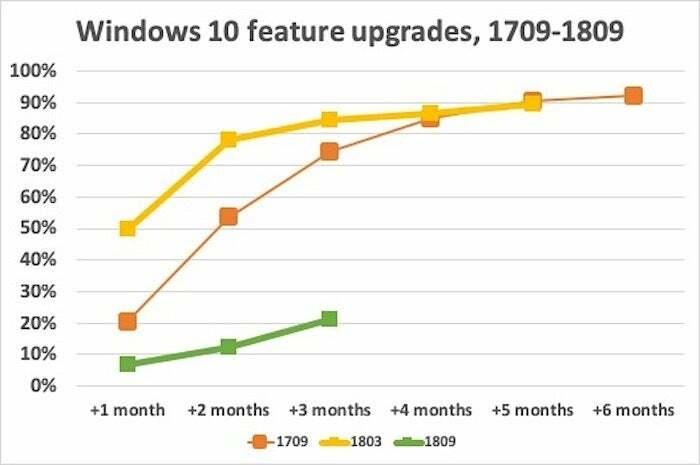 A greatly reduced span between 1809 and 1903 - two months rather than the promised six - would almost certainly anger the Windows 10 users already sensitive to the upgrade cadence. In their minds, Microsoft would be making them deal with two upgrades, two system reboots and twice the possibility of show-stopping bugs, in quick sequence. 2. 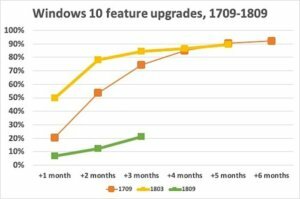 Just skip 1809: There's nothing to stop Microsoft from halting distribution of 1809 as 1903 clears its coding finish line - the Redmond, Wash. company controls the upgrade schedule, after all - so that those PCs not yet migrated to 1809 are upgraded from last spring's 1803 directly to this year's 1903. Skipping an upgrade is, after all, a crucial option for businesses running Windows 10 Enterprise. 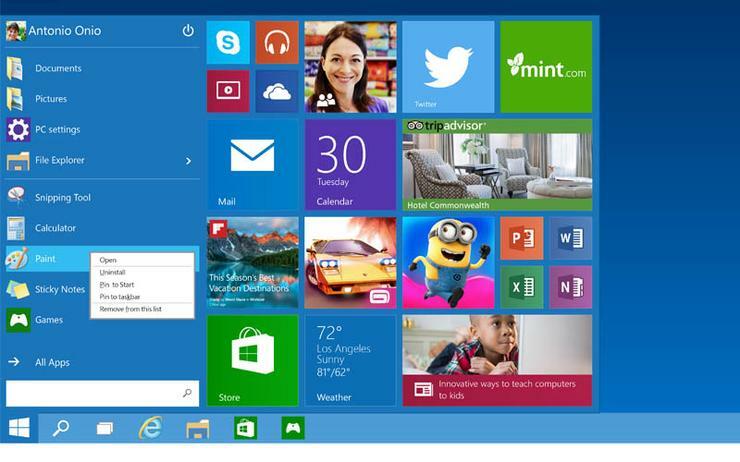 Customers running Windows 10 Home, however, have never had that option. Forgetting 1809 would be the quickest way for Microsoft to get the release schedule back on its rigid track. But it might cause users to ask uncomfortable questions: If the sky doesn't fall when Microsoft skips an upgrade, why won't it let customers make the same decision for themselves? None of this should matter to organisations running Windows 10 Enterprise: They're given 30 months of support for 1809, so they can deploy and run it for a considerable stretch before being obligated to upgrade to a future build. And Windows 10 Pro users are able to defer feature upgrades for up to 365 days, giving them time to run one version before having to switch to another. For example, Windows 10 Pro users could install 1809 next month, defer further upgrades for, say, 180 days, then pick up Windows 10 Pro 1909 before 1809's end-of-support deadline of 12 November. Only Windows 10 Home lacks such flexibility. But that may be changing. Some news outlets last week reported that Windows 10 Home 1903 may sport an option that would let users pause updates for up to 35 days. Although that option, if it reaches Windows 10 Home, would be better suited for avoiding problematic monthly updates until Microsoft quashed all the bugs, it should also allow users to delay the installation of a feature upgrade for a limited time.